Home ... The Arc Blog ... All Posts ... News ... The Arc’s 2014 National Convention – A Rousing Success! The Arc’s 2014 National Convention – A Rousing Success! Thank you to all of the nearly 800 attendees who made it New Orleans for The Arc’s 2014 National Convention. We could not have pulled it off without the support from chapter staff, self-advocates, family members, and professionals in our network. You all help us make this event bigger and better every year. A lot of work went into designing a program that featured not only, educational opportunities and inspiration, but also the passion that brings The Arc’s mission to life. The convention got started with an engaging and captivating opening session. 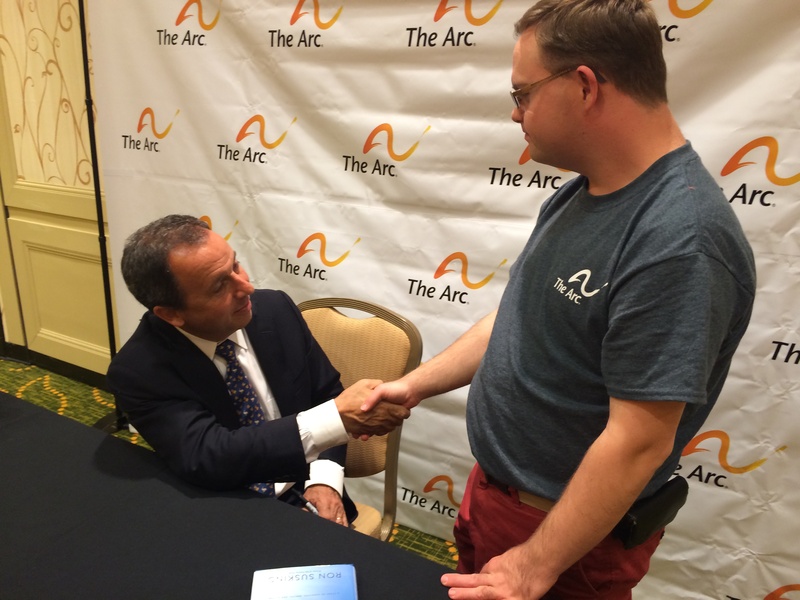 Award winning author Ron Suskind gave an impassioned speech about his new book, Life Animated, that details the remarkable journey that his family went on to reconnect with Owen, their son who is diagnosed with Autism. His speech brought the audience to tears and to their feet. Ron truly felt at home in The Arc’s network and spent more than an hour ensuring everyone who wanted to get their copy of his book signed, talk to him, or even give him a hug was given the chance. Director of National Partnerships for Comcast/NBCUniversal, Fred Maahs, spoke about his desire to use his position to bridge corporations and the non-profits that service communities. Fred also shared his personal story of his physical disability and how it has impacted his career and the goals he has for Comcast. Throughout the convention, attendees were able to network and interact with chapter staff, sponsors, and national initiative partners. Self- Advocates showcased their products and services in Entrepreneur Alley. This year featured our biggest showing of self-advocate entrepreneurs yet! But the convention wasn’t all work and no play. Early risers were able to “Wake and Shake” with Eruption Athletics. Chris Engler and Joe Jelinski of Eruption Athletics (EA) are able to bring physical fitness to people with intellectual and developmental disabilities through informative work out sessions that feature the EA patented Volcano PADD and specially designed music to help inform participants of the specific exercises they have to complete. 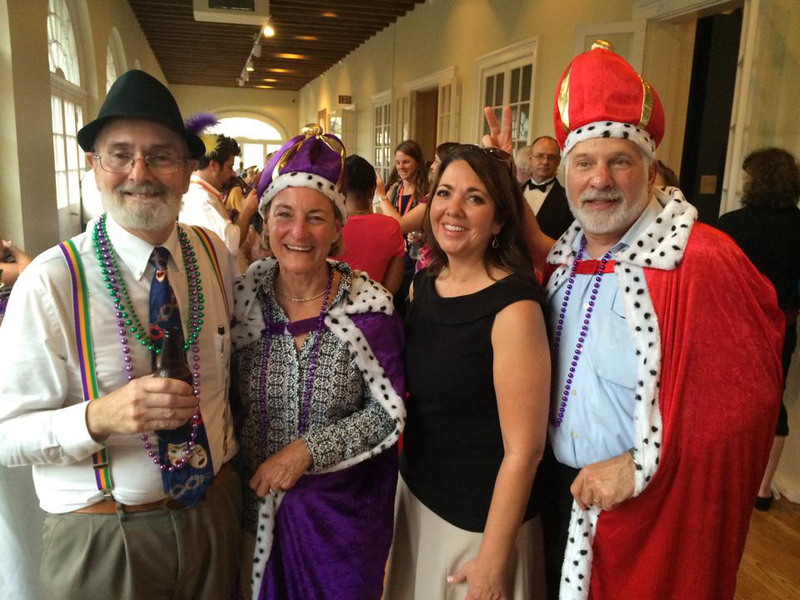 With the convention going off without a hitch, everyone was thrilled to participate in the local host event, which involved a second line parade from the Marriott hotel to The Presbytere. Onlookers from neighboring stores and restaurants waved the parade on, as everyone marched through The French Quarter. At The Presbytere, everyone was able to enjoy jazz music, light refreshments, and view the ongoing exhibits on Hurricane Katrina and the history of Mardi Gras. The convention drew to a close on Thursday afternoon with a sneak preview of the documentary film Children of the Dumping Ground, followed by a discussion with the filmmaker, Chip Warren, led by The Arc’s National Center on Criminal Justice and Disability Director, Leigh Ann Davis. Board President Nancy Webster presented the President’s Award to Dr. David Braddock for his research regarding long-term care, health promotion and disease prevention, and public policy toward people with intellectual and developmental disabilities, and Jim Ellis was presented with The Arc’s 2014 Advocacy Matters Award. For more pictures visit The Arc’s Flickr, and don’t forget to share your photos as well! This entry was posted in News and tagged Convention 2014. Bookmark the permalink.